Bradman Centre Functions | The International Cricket Hall of Fame. Contact Renee Matthewson for more detailed information on 02 4862 1247 or email [email protected] to request an information pack or organise a visit to view the venues. 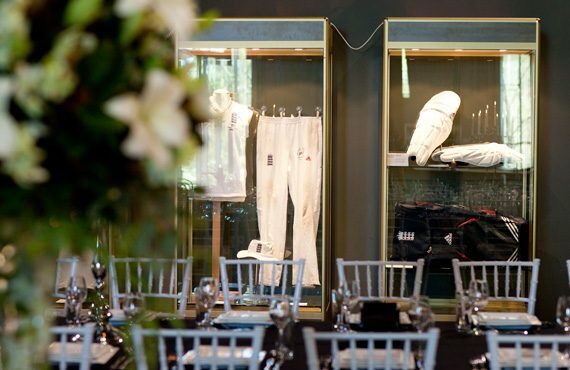 Create a memorable and unique event at the Bradman Centre. Ideal for conferences, cocktail parties, private diners, wake or birthday party, Bradman Centre, in the heart of Bowral, offers an appealing location with a choice of four spaces to suit any event. Catering is prepared onsite using fresh and local ingredients for sit down functions, canapés, hot and cold buffets as well as birthday parties for all ages. Click here to view our sample menus. The iconic Bradman Oval, where Don Bradman himself honed his remarkable skills, is also available for hire. Our staff can organise sporting activities, party games and catering with access to the Bradman Museum and beautiful surrounds. With floor to ceiling windows overlooking Glebe Park the International Cricket Hall is buzzing with cricket atmosphere. The space can cater for up to 200 people for a cocktail party and 140 people for a seated event. There are two mega-screens available to project logos, information, audio-visual presentations or images along with an art gallery wall 40 metres wide. Perfect for presentations, workshops, fundraising events, awards nights or private movie screenings the Heritage Theatre can seat up to 100 people. There is also the option to use the garden courtyard, just off the theatre, before or after your event for drinks and canapés. The Cricket Pavilion overlooks the manicured grounds of the Bradman Centre with doors that open onto the outdoor pavilion on one side and the Bradman fountain and gardens to the rear. The Lower Pavilion is ideal for intimate gatherings or conferences. The room is flooded with natural light and offers indoor and outdoor access. The elegant surrounds of the Bradman Library offers a comfortable setting with a boardroom set up for up to 20 people. The room has an open fireplace, walls of reference books on cricket and a private balcony with expansive views over Bradman Oval and Mount Gibraltar. For large functions both the Cricket Pavillion and the Bradman Library can be hired together. Contact Renee Matthewson on 02 4862 1247 or [email protected] for more information.